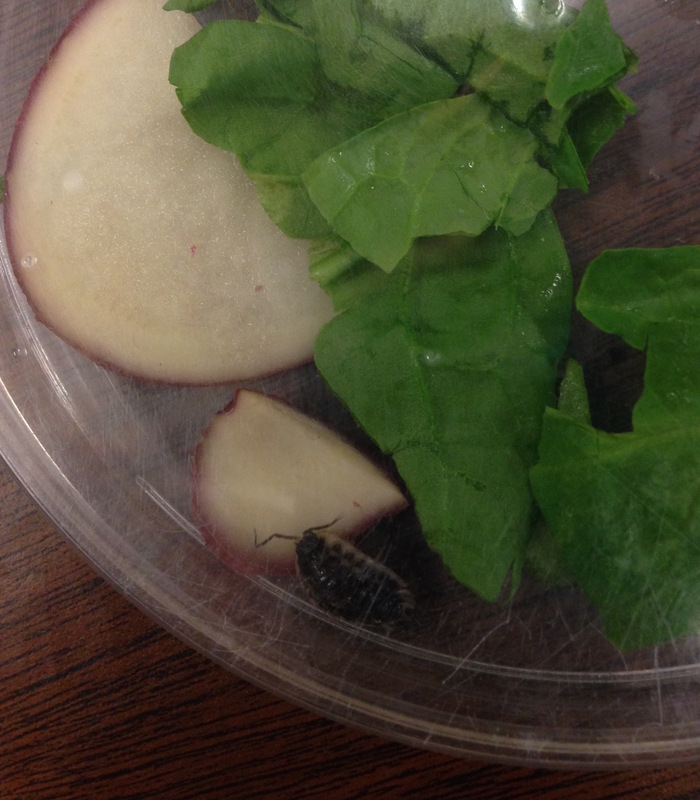 Students each have a live wood bug and test what kind of food they like best: fresh leaves, or composted leaves. The students add their results to a group graph. 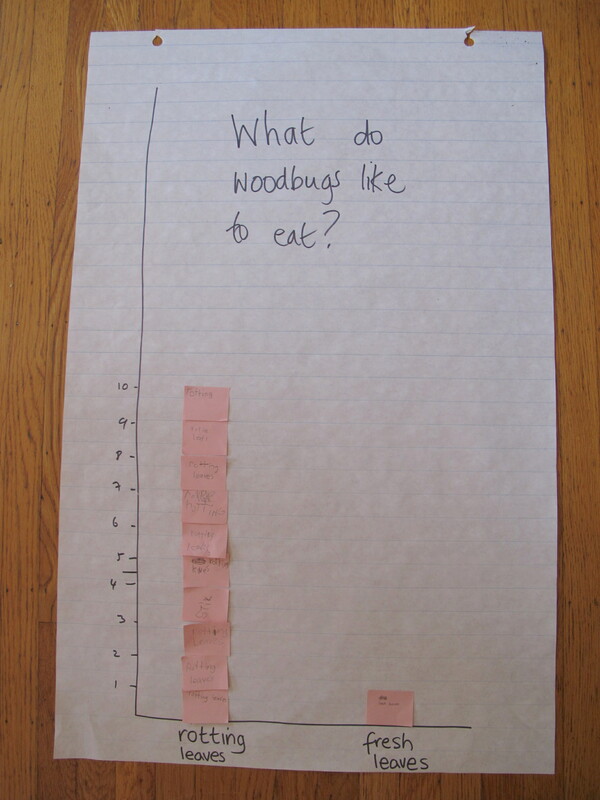 The results can be used to feed wood bugs kept in class. Set-up prior to experiment: a large petri dish, with fresh leaves in one half of the dish and composted leaves in the other half. Optional: add a potato slice in its own section. Wood bugs, one per student in closed containers kept moist with a layer of wet tissue. 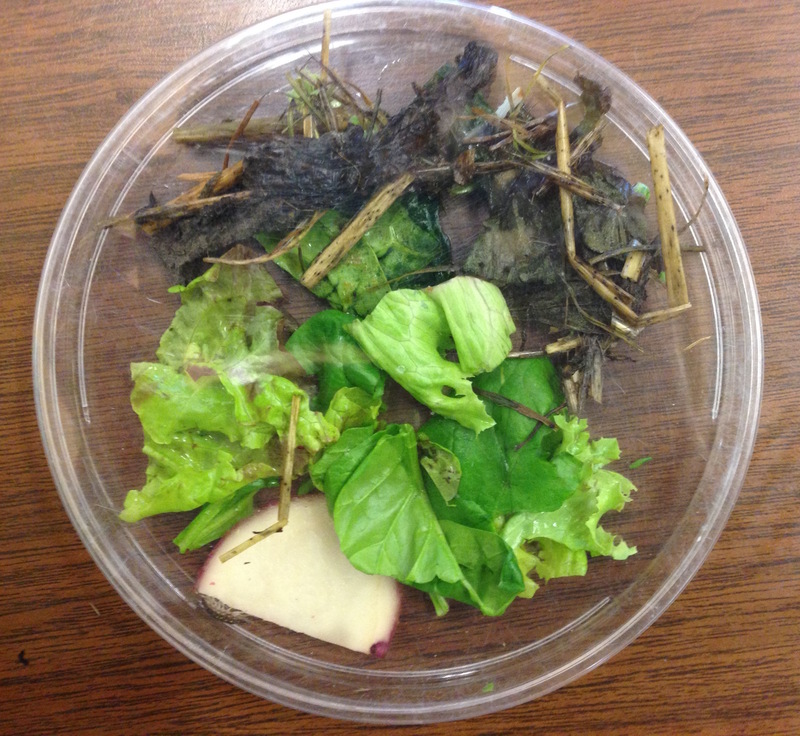 Students tip their wood bug into the petri dish with two food choices, and put on the lid. Adults can help by gently pushing the wood bug with a paintbrush if necessary. Class discussion while the wood bugs to adjust to their new environment (students should not be near the distraction of the wood bugs during the discussion). Ideas to discuss: Talk about how different animals eat different things. Optional prediction: students are asked to predict whether wood bugs would prefer the fresh salad leaves or the partway rotten leaves. For younger age groups, it is best if predictions are done anonymously: ask students to close their eyes, and vote by raising their hand. Class predictions are recorded on the board. A second vote of what the students might like to eat for their own dinner given the same choices lightens up the heaviness of predicting at this age, and gives some thought to how different animals might have different food preferences. (Note: I would recommend skipping this prediction step if the students have not already done a lot of hands-on science with careful observation and recording already. Accurately seeing and recording scientific phenomena is the first step to be mastered, before adding the complexity of thinking ahead and predicting). At their desks, each student records which food the wood bug is on when they look in the dish. They may need help finding the wood bug if they are hidden under leaves. If the wood bugs are moving around, record where they are when the student first looks in the dish. 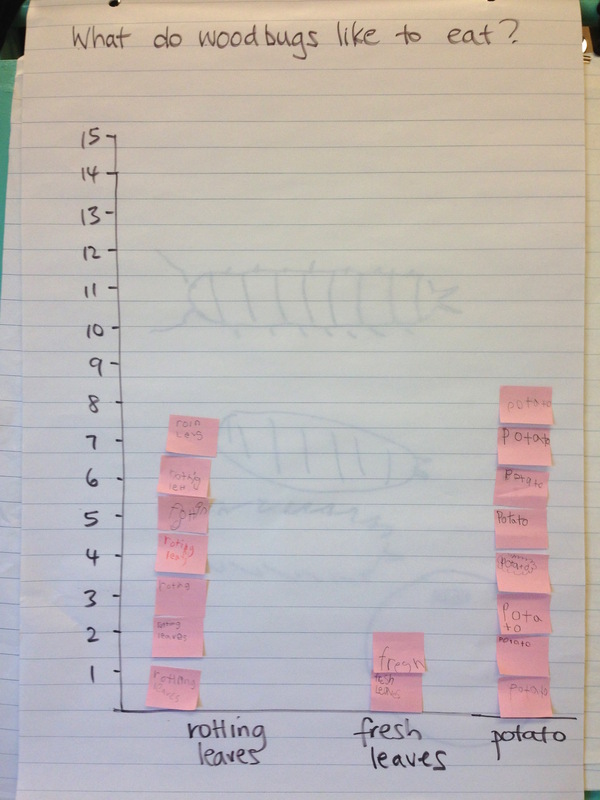 Each student adds their data to a class bar chart. (For the classes I worked with 80% of the wood bugs were on the rotten leaves and the remainder were on the fresh leaves). Conclude as a class what food to put in the habitat for the wood bugs. (For our classes, we added mostly compost and a couple of fresh leaves). Add the food to the wood bug habitat. I am not convinced that the wood bugs are actually choosing food in this activity, as the classroom setting is not the most calming for an animal to want to stop and eat. Make sure they are given enough time to settle to make this activity as close to food choice as possible. That said, over the lessons I have taught this activity, the wood bugs do generally prefer the rotten food and potato over the fresh leaves. The rotten food has more moisture, which might be preferable for wood bugs that are in the dry air of the classroom setting. The food choice can more simply be given in the habitats once they are set up. 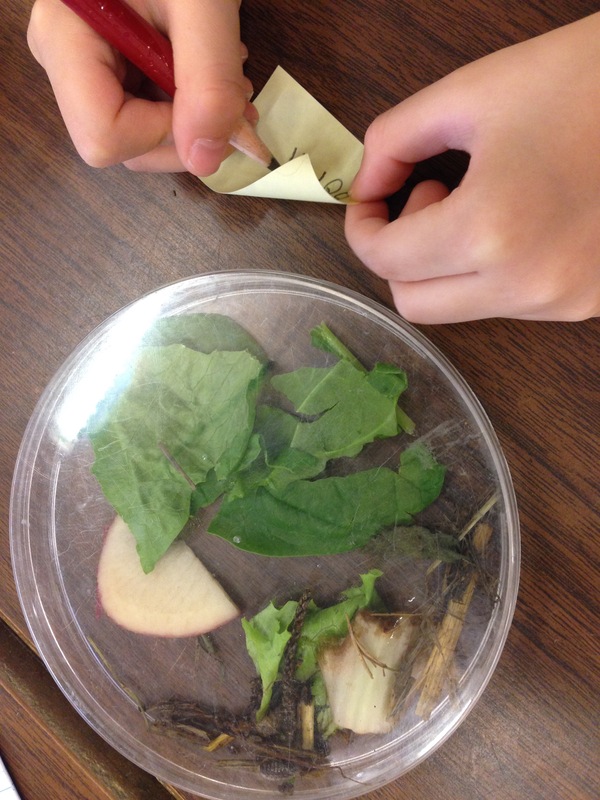 Students give wood bugs food choices and observe what they like to eat over time.